The elegant Theo Sunset Bay Holiday Village is a great place to stay with all the family. 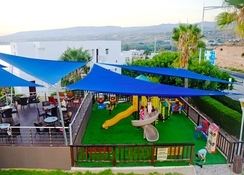 It lies 8km from the centre of Paphos, which means it is a great place for a quieter stay yet still giving you plenty of great things to see and do at both the complex itself and nearby. Paphos International Airport is just 24km away and just five minutes from the nearest beach. 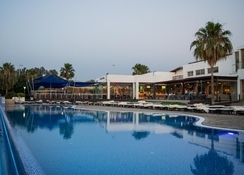 The hotel features a wonderful variety of things to do, whether that’s taking up a sport such as a basketball or tennis or simply relaxing on the sun terrace by the pool or taking a dip in a Turkish bath at the spa. As well as Theo Sunset Bay Holiday Village own restaurant and poolside bar you’ll find numerous excellent restaurants serving within walking distance that allow you to try something new or familiar whilst overlooking the sea. 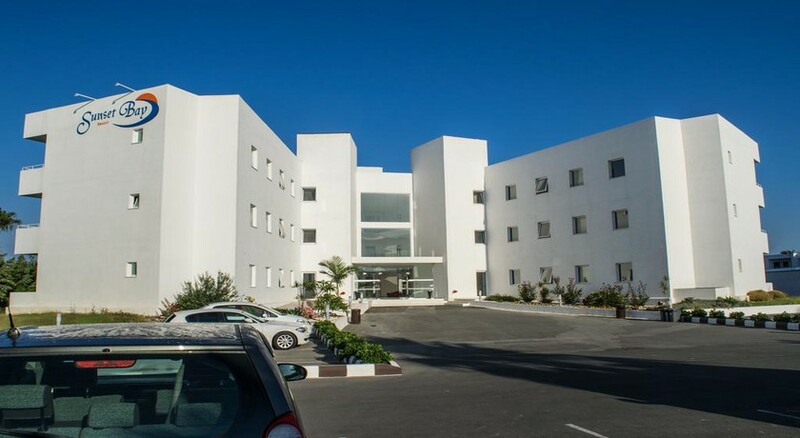 Theo Sunset Bay Holiday Village lies just 24km from Paphos International Airport, so a taxi can have you dropped off and ready to start your holiday in less than 30 minutes after arrival in Cyprus. The city centre of Paphos is 8km away to will require a taxi but also means you’re in a relatively quieter part of the island. The nearest beach, Kissonergas is a mere 100 meters from the village complex. Theo Sunset Bay Holiday Village is surrounded by a great selection of restaurants, most of which offer a glorious view of the Mediterranean Sea as you dine. 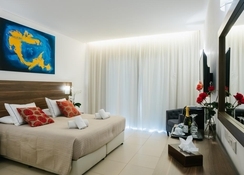 Rooms are available in several flavours, from standard twin rooms that sleep two adults to studios which sleep up to three adults and larger one-bedroom and family studios. Each type of room offers various view options, including sea and landscape. All rooms feature your essentials when away from home such as wi-fi, kettle, ensuite bathroom and safe deposit box. Additionally, all rooms come with a refrigerator. Studios and apartments all feature a fully equipped kitchenette and larger living areas, ideal for larger families to stay at. 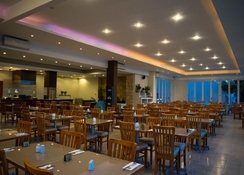 On-site, you’ll find an a la carte restaurant catering to both local and international tastes and serving a buffet breakfast as well as lunch and dinner. There is also a pool side bar selling drinks and snacks in addition to a café. Theo Sunset Bay Holiday Village is also set within a locale which offers an array of great restaurants. Nearby Sonny’s Restaurant serves great home cooked classics and comfort food such as Sunday roast and ribeye steak! Kambana café and taverna is the place to go to get an authentic taste of local Mediterranean dishes. If you’re looking to grab a drink, then great selections can be had at Sea You Beach Bar and Julies Bat & Restaurant. At Theo Sunset Bay Holiday Village, you’ll find a wide selection of activities and ways to unwind on your holiday. You can choose from the indoor or outdoor swimming pools, spa and wellness centre complete with sauna, jacuzzi, Turkish bath and much more. Take up a sport of your choice with options including tennis, basketball and volleyball. You can also venture out into the Mediterranean and experience the thrill of any number of water sports such as surfing, water skiing and scuba diving, just ask at the reception and they’ll be glad to help you organise just what you want to do. If you’re prepared to do a little travelling away from your hotel then check out the Adonis Baths with its waterfall and bathing pools and mud therapy about a 30-minute taxi ride.